In the previous post I wrote about building an on-board buffer. This time I would like to show you some guitar wiring with this thing. It's not very complicated. It's based on one buffer circuit, three potentiometers: 2x volume, 1x tone and one tone capacitor - in quite untypical value range. The first volume potentiometer is placed before the buffer. I putted it here, because i don't want to lose this special impact of the passive 500K volume control. It will make the guitar tone a little bit warmer. There will be also a possibility to cut off a little bit of treble, by turning the pot down a little. After this stage, the signal will go right to the buffer. Everything after the buffer will work different than in a passive circuit. 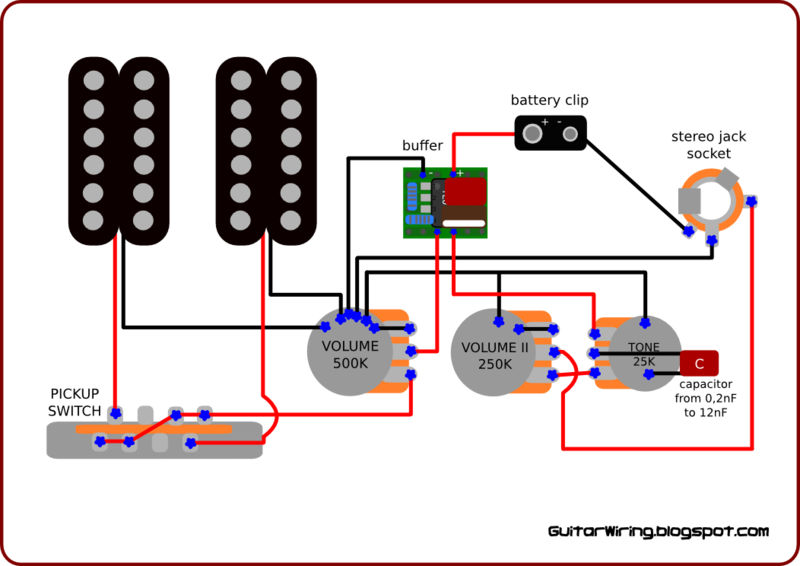 The first thing where the signal will go, after the buffer's active circuit, will be the 25K tone potentiometer. It's connected with the tone capacitor. As you can see, the cap have some wide value range – from 0,2nF to 12nF. 0,2nF will allow you to shape the signal only a little – it will be a kind of a contour control. 12nF will give some more drastic tone control. If you will turn the knob all the way down, the tone will be very bassy and dull. It's not the same type of a tone control like in a passive guitar wiring. There is possibility to make the same tone tune with two different values of capacitor. For example, a lower value cap will need a greater turn of the pot, to reach the same tone tune (frequency cut level) like a higher value cap with some smaller turn of the potentiometer. You should choose the right cap for your own preferences. Maybe you will need to test a few values. 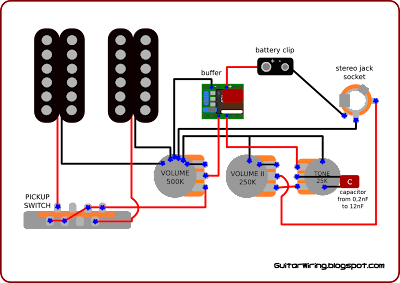 After the tone control stage, the guitar signal will go to the second volume pot (250K). This volume control stage is „clean”. It means, that it will not affect the sound like the 500K, passive vol. control - the tone will not lose treble. Now lets look on the buffer, the battery clip and the jack socket. They are connect together in some special way. The minus wire of the battery clip should be connected to the ground – and it will be connected like that, but only if the jack plug (typical, mono) will be in the jack socket (stereo). In this way, you will save more battery power. The circuit will be closed only with the plug in the socket. The same way of the battery wiring is used by EMG with their active pickups. All functions of this wiring can give you a lot of tone combinations, which are possible only with an active buffer.